Many players, and unfortunately some coaches, look at other players and judge their ability solely based on athleticism—how quickly the players moves, how high they jump, how much they can lift, and how smoothly they execute a sports skill. Larry Bird: Although he was a great NBA basketball forward who possessed an outstanding outside shot, incredible court sense, and an indomitable will to win, he lacked quickness and jumping ability. Andre Agassi: One of the best ball strikers of all time, his tennis success was based more on superb hand/eye coordination, exceptional anticipation, and aggressive game tactics than any outstanding physical characteristics. 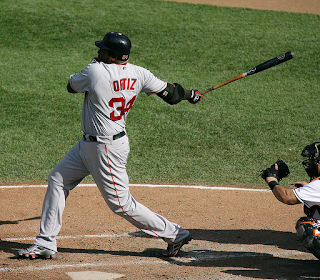 David Ortiz: Despite being heavy and slow running the base paths, his outstanding ability to hit a baseball has enabled him to enjoy great success and a long career in Major League Baseball. Mike Eruzione: Considered too small and too slow by professional scouts, he captained the 1980 USA Olympic hockey team, scoring the game winning goal over the heavily favored Soviet Russia team. At lower levels of competitive play, many athletes with limited athleticism are successful. Young athletes with less than ideal body types find ways to win against opponents with more perfect physiques. Talent is not limited simply to a player’s physical characteristics; but also can encompass characteristics more closely associated with the mind and “heart.” These less tangible attributes are not as easily seen and measured as the physical ones, but they are important. Performing under pressure, demonstrating character and leadership in difficult moments, persistence, and the will to prepare are all special qualities that can distinguish one athlete from another. You should also understand that these types of talents are ones that many other players do not inherently possess. Don’t underestimate their importance. They can provide you with a competitive advantage against physically superior athletes. Several years ago, I coached a middle school basketball team that included a seemingly non-athletic eighth grade boy who moved awkwardly, without much speed or quickness. He lacked ball skills and the ability to consistently convert any shot other than a layup. In evaluating John, my first impression was that I would need to find limited roles for him to play. Although having only average height and jumping ability, the forward position was the one best suited to his physical build and abilities. In our first practices and games, I noticed that John was always around the ball, running the floor, constantly positioning himself to receive passes and rebound the ball. He had an uncanny ability to anticipate ball and player movements, and position himself to gain an advantage. As John’s shot improved through the course of the season, and he learned more individual skills and team concepts, he became one of our team’s most valuable players, helping lead us to a victory in our league’s championship game. So, even when you don’t possess the ideal physical characteristics for your sport, remember that there are still many paths to success. The 'instinctive' player is a diamond in the rough, for sure, Jeff. You write, "He had an uncanny ability to anticipate ball and player movements, and position himself to gain an advantage." I think these often these players are responding to cues on the court that they don't even realize they perceive. A slight turn of the shoulder tips us off that he will move that way. etc. Teaching my youngest to drive recently reminds me again that I "know" more than I realize about what the other drivers will do. The key to teaching it (and perhaps coaching it) is pinpointing what cues we use - without thinking about them - and then helping the youngster (or newbie) to look for these. Tony Dungy has mastered this technique in his coaching. We could all learn from his approach. What comes "naturally" to us, didn't always, even if we had great court sense. The young player will be well-served if we can spell this out for them. It's where good teaching becomes great coaching. Agreed. Excellent players anticipate events before they happen, recognizing clues that they only perceive subconciously. In his book Blink, Malcolm Gladwell talks about this process. Experts feel when something's right or wrong. They pick up the subtle clues "behind the curtain." The same process applies to athletes. Repetitions, experience, and possibly some concious techniques that can be taught by coaches, help develop this ability in a young athlete. I like using scrimmages to help kids become more aware of these subtle clues or situations in which they can either gain or lose advantage. As coaches who've played the game, we instinctively recognize these situations. By "coaching kids up", talking to them as events unfold, we can help bring these moments into focus. This is also one more reason why kids should play pickup. More repetitions help develop this subconcious stimulus/response ability. When I was helping out coaching the local high school's girls basketball team, it was obvious that most of the girls were deficient in this area. They could shoot the ball well, and execute other skills in a reasonably proficient manner. But they often failed to "see" the court. They didn't recognize patterns of play. They often missed opportunities to make that one move or decision that would have led to an advantage. With this group of females, I strongly suspect that their lack of pickup play was part of the problem. Should a Parent be a Coach?